Pier 53 Marine is proud to provide full-service operations at two locations! With the addition of Pier 53 Marine Sandusky and our home location on Catawba Island, we’re right where you need us! Our goal is to provide the best professional and hassle-free service possible. The staff at Pier 53 Marine combines over 40 years of service experience. We are a certified Volvo, Yamaha, MerCruiser and Mercury dealer. This gives us the resources to keep you on the water all summer long! For any of our services, please complete our Service request form on this page or call us today to schedule your appointment. It’s official we are now your local SEAKEEPER Dealer. Professional sales, service and installation. SEAKEEPER products have an amazing effect on boat roll! Call our Service Department for details. Our certified technicians are ready to service all your gas and diesel engine needs. Anything from basic oil and lube changes to advanced diagnostics of your vessel. Preventive maintenance programs are available for all vessels. Our certified Service Department is fully mobile! We can come directly to your house, dock, marina or where ever your boat is located. One of our mobile service vehicles will be dispatched when you are unable to come to us. Sales, service, and installations available. Our rigging department can provide customized installations of almost any configuration of navigational and/or vessel operation equipment. Starting from a clean slate or upgrading your current equipment, our technicians are certified for Raymarine, Garmin, Lowrance and Simrad service, and installations. We offer boat hoist service for any reason a haul-out is necessary. Port Clinton or Sandusky locations can handle your repairs and get you back in the water quickly. The attention to detail from our well-trained staff is second to none. From weekly washes to full multi-step gel-coat restorations, you can count on the crew from Pier 53 Marine to make your boat shine like new! One time or periotic detailing can be scheduled to fit your needs. Pier 53 Marine offers full-service winterization and spring launch. We provide everything your boat needs for a safe winter and a spring launch. 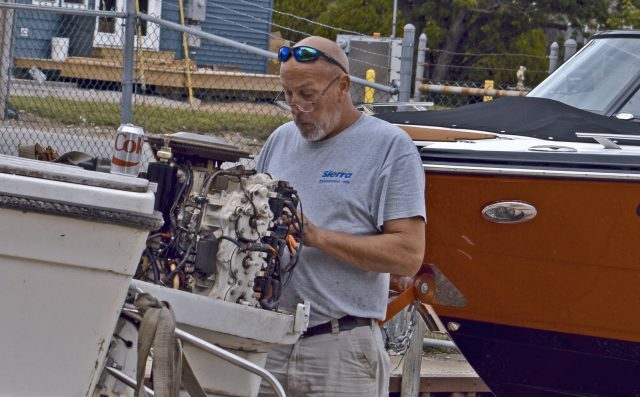 We can pick-up your boat and perform all the necessary services. With the addition of our comprehensive storage and shrink-wrap options, your vessel will be safe all winter long. Contact Us today to schedule your service needs!